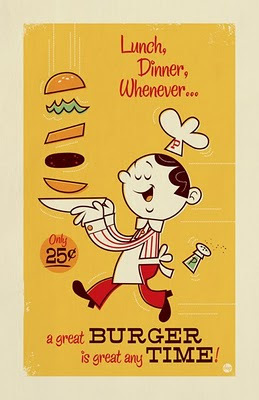 Title: "A great BURGER is great any TIME!" Show opens Friday, September 16th • 7-10 pm and runs til October 8th. My friend got me a print from the show! I love it! Loved playing this game as a kid on my Apple II. I got a chance to play this about a month ago at Funspot in New Hampshire. Great artwork that brings back a lot of memories! Any chance of a reprint? This poster is awesome with all the references and style!